Background: Hyaluronic acids act upon keratinocytes via CD44 receptors and regulate proliferation and differentiation. Some cosmetic hyaluronan lotions manufactured based upon the fact are nowadays available. Aims: To evaluate a cosmetic hyaluronan lotion (Dr. Fukaya’s skin repair lotion or Hyaluprotect) from the viewpoint of anti-aging effects and to consider its mechanism. Patients/Methods: In ten healthy volunteers at the age over 60, immunohistochemical research of the biopsied skin was performed before and after the application of the hyaluronan lotion for two weeks. Results: Expression of PCNA in the lower epidermis increased in 8 of 10 subjects. Filaggrin expression of the upper epidermis increased in 6 subjects. 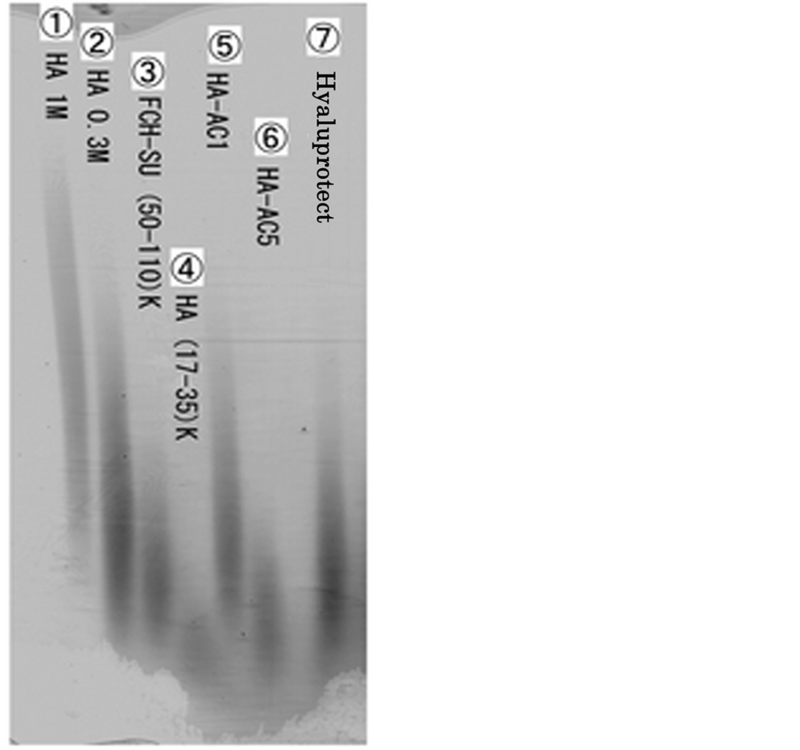 11βHSD1 decreased in 5 subjects and 11βHSD2 increased in 5 subjects. Conclusions: The proliferative and differentiative effects of the hyaluronan lotion upon keratinocytes were confirmed immunohistologically. There is a possibility that hyaluronic acids work through the regulation of corticosteroids by 11βHSD1 and 11βHSD2. Hyaluronic acids have been proved to be important stimulants onto keratinocytes via CD44 receptors. Kaya  reported that intermediate sized HA fragments (HAFi) of 50 kDa to 400 kDa were effective in recovering the epidermal atrophy due to aging in patients over 60 years old. Barnes  added the knowledge that HAFi can compete with the epidermal atrophy due to corticosteroids. Bourguignon  revealed that hyaluronic acids of around 27 kDa in molecular weight have the effect of cell proliferation while 700 - 1000 kDa HAs increase filaggrin in the upper epidermis. The effects of HAs seem to be different according to their molecular weights. As the above articles interested the developers of skin care materials, there appeared such products that aim at anti-aging effects grounded on them. Dr. Fukaya’s skin repair lotion (Japanese product name is Hyaluprotect) is one of them. The lotion is made of FCH-SU of Kikkoman Biochemifa Co. as a principal ingradient which is HA originated from the product of streptococcus zooepidemicus and its main molecular weight is published as 50 - 110 kDa. The other components of the lotion involve 0.3% of phenoxyethanol as a conservative, 0.0012% of iodopropynyl butylcarbamate as an anti-fungal agent and 0.0094% of hydroxypropyl beta cyclodextrin as a solubilizing agent. The author evaluated its efficacy to the epidermal atrophy due to aging by immunohistochemical study before and two weeks after application of the lotion to the neck in aged volunteers over 60 years old. Ten healthy aged volunteers were enrolled in the study under the written informed consent. The admission by an ethical committee was obtained beforehand. All patients were over 60 years old and the average age was 73.2. Two were male while eight were female. The neck skin was biopsied by 1.5 mm trepan and application of the lotion two times per day followed. After two weeks the second biopsy was undertaken from the neck skin. The specimen were fixed by 20% formaldehyde solution immediately and submitted to paraffin embedding procedure. Enzyme labelled immunohistochemical staining was performed using anti-PCNA, filaggrin, 11βHSD1 and 11βHSD2 antibodies. The manufacturers and dilution rate of primary antibodies are as follows. PCNA; NeoMarkers: ×1000, filaggrin; Abcam: ×100, 11βHSD1; Santa Cruz Biotechnology: ×200 and 11βHSD2; Santa Cruz Biotechnology: ×400. All paired specimen were stained at a time for avoiding technical variance of color densities. As the study aims to compare the findings before and after application of the lotion, the results were simplified using mathematical symbols of <,> and =. Namely, before < after means the expression of the targeted antigen has increased. As a supplementary examination to detect the distribution of molecular weight of the lotion, agarose gel electrophoresis was performed together with various kinds of cosmetic materials of hyaluronic acids. In 8 of 10 subjects, PCNA positive cells increased. Filaggrin expression increased in 6 subjects. 11βHSD2 increased in 5 and decreased in only one subject while 11βHSD1 decreased in 5 subjects. All the results are in the Table 1 and photographs of two subjects (cases 1 and 2) are in the Figure 1 and Figure 2 for the purpose of presenting examples. 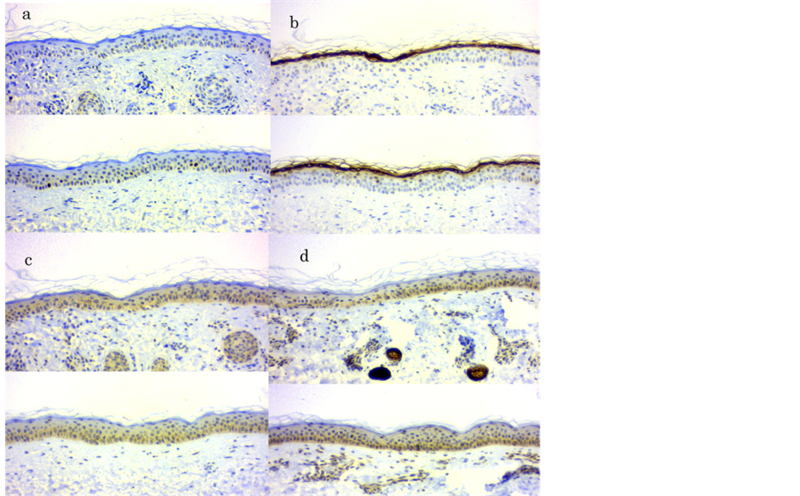 In case 1, PCNA-positive nuclei increased in number (a), filaggrin increased in the corneal layer (b), 11βHSD1 didn’t change (c) and 11βHSD2 increased especially at the basal layer (d). In case 2, PCNApositive nuclei increased in number (a), filaggrin increased in the corneal layer and upper of the keratinocytes (estimated granular layer) (b), 11βHSD1 and 11βHSD2 didn’t change ((c), (d)). Table 1. The result of comparison of the findings before and after application of HA lotion is shown. Figure 1. Immunohistochemical staining before (upper) and after (lower) application of HA lotion in the case 1. (a) PCNA, (b) filaggrin, (c) 11βHSD1, (d) 11βHSD2. 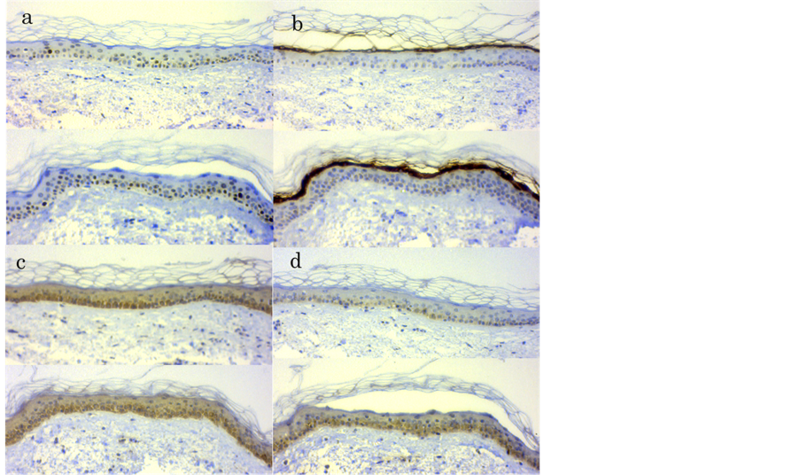 In PCNA, filaggrin and 11βHSD2 the staining intensity increased after the application of HA lotion. Figure 2. Immunohistochemical staining before (upper) and after (lower) application of HA lotion in the case 2 is shown. (a) PCNA, (b) filaggrin, (c) 11βHSD1, (d) 11βHSD2. Note that filaggrin is expressed not only in the corneal layer but also in the upper keratinocytes in the lower photo of (b). PCNA (proliferative cell nuclear antigen) is a marker of activity of cell division and proliferation. Kaya  and Bourguignon  also demonstrated PCNA expression increases in keratinocytes by application of intermediate or small sized HAs. The result in the study coincides with their results. Filaggrin expression on the upper epidermis or the corneal layer was also reported by Bourguignon by application of larger molecular sized HAs. The result in the study also agrees with Bourguignon’s though the molecular size seems to be much smaller. Kaya’s or Bourguignon’s HAs were strictly fractionated according to molecular size while the hyaluronic acid lotion in the study is for the commercial use and the molecular size ranges rather wider (Figure 3). So the effect of filaggrin expression can be due to the same mechanism as Bourguignon’s by its inclusion of the larger sized HAs. Figure 3. Electrophoresis of various cosmetic hyaluronic acid materials and products is shown. 1 (HA 1M); a material with a main peak at 1000 kDa, 2 (HA, 0.3 M); a material with a main peak at 300 kDa, 3 (FCH-SU (50 - 110) k); The raw material used in the product examined in the study with the peak range at 50 - 110 kDa, 5 (HA-AC1) and 6 (HA-AC5); Other products for cosmetic use, 7 (Hyalupurotect): the product examined in the study. Note that upper portion of No. 7 coincides with the peak in No. 1 though the density is weaker. As the experiment is complementary one, molecular weight markers were substituted by 1-4. Keratinocytes have been recently revealed to produce corticosteroids by themselves  . The synthesis of corticosteroids is balanced by two isozymes of 11βHSD1 and 11βHSD2. The former converts inactive cortisone into active cortisol and the latter reverses them. It is well known that corticosteroids fall the epidermis into atrophy as a side effect. So there is a possibility that hyaluronic acids increase the PCNA positive keratinocytes by suppressing 11βHSD1 or accelerating 11βHSD2. As a result in the study, 11βHSD1 suppression or 11βHSD2 acceleration was observed in 9 of 10 subjects. It suggests the possibility that proliferation of keratinocyte due to HAs is controlled by the density of cortisol in the epidermis. Further study at the level of RNA expression of the two enzymes in keratinocytes is desirable by using cultured cells. It is the limitation of the study using biopsied specimen. Dahl  reported that HAs of around 100 kDa temporarily increases in the amniotic fluid of the 16th weeks of pregnancy. The period coincides with the time of epidermis formation of stratifying. Ghazi  reported 100 - 300 kDa HAs have the ability of improvement of wound injury. Pandey  reported 40 - 400 kDa HA activates NF-κB mediated gene expression and its peak activity was observed in 137 kDa. These findings suggest HA of the range has the possibility of becoming an anti-atrophic or anti-aging agent. HAs have long been regarded as the simple moisturizer that retains water on the surface of the skin in the field of cosmetology. However there are farther functions beyond it   . It is very reasonable and natural if the aged atrophic skin can be rejuvenated by hyaluronic acids in the amniotic fluid at the period when the embryo’s skin is constructed. The author reports no conflicts of interest except accepting Dr. Fukaya’s skin repair lotion only for the study from Dr. Mototsugu Fukaya. The immunohistochemical staining was performed at Morphotechnology Co. (Sapporo, Japan) and the expenses were also born by him. Kaya, G., Tran, C., Sorg, O., et al. (2006) Hyaluronate Fragments Reverse Skin Atrophy by a CD44-Dependent Mechanism. PLoS Medicine, 3, 2291-2303. Bourguignon, L.Y., Wong, G., Xia, W., et al. (2013) Selective Matrix (Hyaluronan) Interaction with CD44 and RhoGTPase Signaling Promotes Keratinocyte Functions and Overcomes Age-Related Epidermal Dysfunction. Journal of Dermatological Science, 72, 32-44. Dahl, L.B., Kimpton, W.G., Cahill, R.N., Brown, T.J. and Fraser, R.E. (1989) The Origin and Fate of Hyaluronan in Amniotic Fluid. Journal of Developmental Physiology, 12, 209-218. Nyman, E., Huss, F., Nyman, T., Junker, J. and Kratz, G. (2013) Hyaluronic Acid, an Important Factor in the Wound Healing Properties of Amniotic Fluid: In Vitro Studies of Re-Epithelialisation in Human Skin Wounds. Journal of Plastic Surgery and Hand Surgery, 47, 89-92.